Miss B is in BIG trouble again oh! I went to see my friend in Oxford on a spontaneous trip. Oxford is a gorgeee town, very quintessential, posh, lots of old buildings, cobbled streets, environmentally concious old and young people seeking knowledge from one of the greatest learning institutions in the world. Here are some pics I took with my blackberry! So my friend decided to take me to Bicester village, which is a designer outlet mall just outside oxford. It was so lovely, and had so many designer stores at discounted prices. We had so much fun going in all the stores, taking pics, acting a fool and gossiping about rich people laden down with bags from Gucci, Prada, Dkny, Miu Miu, Jimmy Choos and Dior. Now the whole point was to window shop, walk around and just have a fun day out. I am broke as a joke, and have been living like a church rat on my minimum wage salary. That was before we came across this stunning work of art in Ted Baker. Once we touched it we knew there was no way we could walk away. It was on sale for half price, and we both bought it! I have a deep weakness for handbags and purses. I think I need handbag therapy. It is the only thing that freaks me out. I love shoes too, but not half as much as I love bags. Most of my clothes are cheap, and so are most of my shoes. But all of my handbags are expensive. It started from my 18th birthday when my mum gave me a valentino bag from her trip to Italy. She is also addicted to bags, so alot my bags I get from her. From my Dkny, BCBG Max Azira, Guess, Marc Jacobs, Tods, Calvin Klein and now T.B, I LOVE my handbags! The problem is that like I said I could not afford it. So I had to withdraw money from my savings account to pay for it. I knew it was a very bad idea, but I wasnt thinking rationally at that point. As if to re-enforce how bad it is, as soon as I got back home today, my water bill was waiting for me. I opened it, and it was the EXACT same price as the bag. It was as if God was punishing me for my foolish deed! Sigh! If it was anything else, I would be considering a return or getting depressed, but I love it way too much! I guess I will be soaking garri for a while. For the ladies, here are my tips on how to get the best handbags on a budget. 1)Invest in SIMPLE designs, especially when you are spending a lot of money. You don't want to buy a bag thats very seasonal because it will look out of date quicker. For designers with logos such as Dkny, C.K and Guess, always buy their classic logos, not the re-invented ones. 2)Choose classic colours, black, brown, beige, cream, and your favourite colour. For me this is purple, so I would buy an expensive purple bag. At the same time, certain bags look better in shocking colours such as white, yellow, green and of course red. But for these always make sure they are plain. A brightly coloured bag with loads of detail and pattern is a no no for me. 3) Always opt for leather. Once you are spending over £60 make sure it is a genuine leather bag. Spending that much money on a cloth bag or any other material is not worth it to me, but some people don't mind. 4)Make sure it has a long handle. Bags with short handles always look so cute and lady like, but they are a pain to carry and usually not practical in the long run. But if you feel you can hack it and its hot enough then go ahead. 5) Check the body for any markings. As you are spending that much money, it has to be in PERFECT condition, with no dents, scratches or creases to the leather. If it has this, then show them at the counter and they'll usually sell it at a reduced rate. I got 10% off the bag today cause there was minute scratch on the bag that my friend never noticed until I pointed it out. You have to demand perfection. 6) Try as much as possible to buy expensive bags when you are away from England, especially if you have the chance to go to America, Dubai or China. The currency conversion from pounds will make your purchasing power so much stronger, and they are always over 50% cheaper. Most importantly, you have to LOVE it. If you like it or are unsure, then its not worth it. Can you guess which designers these are?? All this knowledge is not going to pay my bills sha, so its indomie and garri soaking for me for the next month until I get paid! Sigh, I need some money managent skills and some self control. Any advice??? I know exactly how you feel. I'm a budding shopaholic myself, but I think my own trap is jeans. I LOVE jeans, and hoodies. But I'm more of an anything-that-I-love kinda shopaholic. My love for handbags is new so thanks for the advice, but I should totally be careful with my money seeing as I don't have a job. Or an allowance at this point. Yes, I know, it's only the 8th, but it's school that finished that one for me lol. Could you pass the gari, please? loool, at this point Fierce, i dont even think i can share my garri!! im so noy a jeans person as i can wear the same pair for 2 months straight! its quite disturbing! girl, I understand. I'm a recovering bag freak that has learned to curb the impulse. One bag a year now, lol! Just make sure that you can pay the rent and other bills while you soak garri. Couldn't guess as to all the bags, but the red one is Louis V. I like LV. 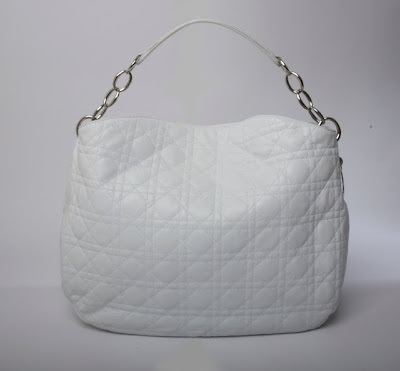 Not much of a handbag person but these ones look lovely, esp the white. i currently own exactly 5 bags. All of which were gifts. im not a bag person, infact the greatest requirement for buying a coat is one with pockets big enough so i can put stuff in them. BUT SHOES ehen dat one is my medicine. I kept laughing all the way cause it seemed like i was reading me!i just got 6bags that come to think of it i don't really need but just couldn't let go.. even against my mum's warning.. Now, na siddon look I dey.. I'm heading to the garri factory for my ration for 4months.. God help me not to do this again...nice bags though..and nice write up.. hope you good?take care. Ahh none of u guys can guess? 3)Dior- you have not known softness until you caress the fine leather detailing of this work of art! But I wish I was not a handbag person cause shoes etc are a much cheaper addiction, or at least thats how it seems to me at the moment! Excellent blog! I actually love how it’s easy on my eyes and also the data are well written. I am wondering how I may be notified whenever a new post has been made.